Painter and illustrator. She studied at the Slade School of Art in London from 1932 to 1936 under the theatre designer Vladimir Polunin, who had worked with the Ballets Russes. She briefly painted Stage sets and later became a portrait painter. During the war she served in the Land Army and the Woman’s Voluntary Service. In 1946 she resumed easel painting. 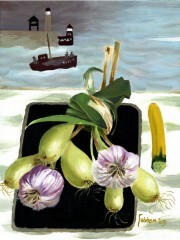 She held her first exhibition at the Mansard Gallery in Heal’s Department Store in 1947, showing a number of still life and flower paintings. She was subsequently commissioned to paint covers for Woman magazine. In 1949 she moved to Durham Wharf, a complex of studios on the Thames at Chiswick. In 1951 she married the artist Julian Trevelyan, whom she had met before the war. Together they travelled in Europe, Africa, India, Russia and America. Since 1946 Fedden has painted prolifically and has had regular exhibitions at the Redfern Gallery, the New Grafton Gallery and many other galleries throughout Britain. She painted murals for the Television pavilion at the 1951 Festival of Britain. From the late 1950s she taught painting at the Royal College of Art. In 1992 she was elected to the Royal Academy and she has been a member of the Royal West of England Academy at Bristol since the mid-1930s, serving as its President from 1984 to 1988.